Osteoporosis Guidelines: When Should I Get My First DEXA Scan? If you’re 65 or older, you should get a DEXA scan no matter what your risk. The DEXA scan is the standard way to screen for osteoporosis. For women 50 and older, the chances of experiencing a bone fracture are astonishingly high at 50 percent. And while any fracture is serious when it occurs late in life, a broken hip is particularly serious and occurs in 7% of women after menopause. There is no doubt that breaking a hip can be a life-ending experience for women, greatly increasing the chance of dying or needing nursing home care, and leading to isolation and depression. Getting evaluated and treated for bone loss is crucial for every woman’s healthcare, and the DEXA scan is the standard way to screen for osteoporosis. DEXA (or DXA) stands for dual energy X-ray absorptiometry. It measures bone mineral density and is a relatively inexpensive test usually covered by insurance. The most recent osteoporosis guidelines, based on the latest research and consensus among physician groups, is that DEXA scan should start at age 65 for healthy women not at particular risk for osteoporosis. Thereafter, women should undergo a DEXA scan every 2 to 5 years, depending on their osteoporosis risk factors. Unfortunately, recent evidence shows that many older women are not receiving the proper screening and treatment. Despite the standard recommendation for screening of all women aged 65 years and older, only about 30-50% of eligible women get a bone density test. Are Too Many Young Women Being Screened? On the opposite end of the spectrum, the latest research reveals that too many younger women may be getting unnecessarily screened for osteoporosis with a DEXA scan. This often leads to overtreatment which causes more harm than good. DEXA screening for osteoporosis is one of the top five overused tests according to a 2012 report released by the American Academy of Family Physicians. It should not be used in women younger than age 65 with no risk factors, the Academy emphasizes. Learn more about DEXA bone density scores here: Bone Density Chart: Understand Your Bone Density Scores. If you’re a woman younger than 65, you should consider getting a DEXA if you have risk factors such as a fracture from minor trauma, rheumatoid arthritis, low body weight, or a parent who had a hip fracture. Additional reasons for getting tested before age 65 include using excessive drinking, smoking, or using corticosteroid drugs for a long time. The commonly used drugs for treating osteoporosis are known as bisphosphonates. These drugs like alendronate (Fosamax) and ibandronate (Boniva) pose numerous risks and may, in fact, do more harm than good especially in women with osteopenia who still have only modest bone loss and are considered low-risk. There is little evidence that people with osteopenia benefit from the drugs which have side effects that include thigh fractures, throat or chest pain, difficulty swallowing, heartburn, and bone, eye, joint and muscle pain. More rarely, patients on these drugs can experience bone loss in the jaw, and abnormal heart rhythms. So, if you’re 65 or older, you should get a DEXA scan no matter what your risk. If you’re less than 65, the decision to get a bone density test depends on your risks. One way you can self-assess your risk is to use a tool called the FRAX. This tool was developed by the World Health Organization and is available here. You can also take the National Institutes of Health questionnaire “Are You at Risk for Weak Bones” online here. No matter what the state of your bone health, natural prevention and treatment is not only possible but is the recommended way to go. U. S. Preventive Services Task Force. Screening for osteoporosis: U.S. Preventive Services Task Force recommendation statement. Ann Intern Med. 2011;154(5):356–364. Warriner AH, Outman RC, Kitchin E, et al. A randomized trial of a mailed intervention and self-scheduling to improve osteoporosis screening in postmenopausal women. J Bone Miner Res. 2012 Jul 26. Schnatz PF, Marakovits KA, Dubois M, O’Sullivan DM. 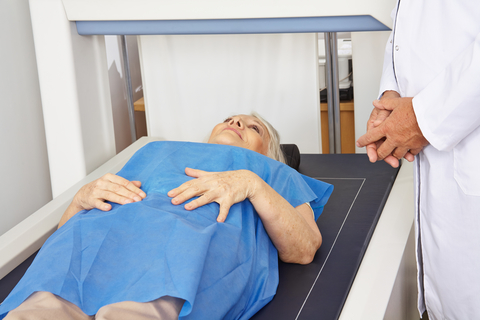 Osteoporosis screening and treatment guidelines: are they being followed? Menopause. 2011 Oct;18(10):1072-8. Guggina P, Flahive J, Hooven FH, et al. Characteristics associated with anti-osteoporosis medication use: Data from the Global Longitudinal Study of Osteoporosis in Women (GLOW) USA cohort. Bone. 2012 Sep 3. pii: S8756-3282(12)01170-2. American Academy of Family Physicians Releases ‘Top 5’ List Of Possibly Overused Tests and Procedures. April 04, 2012. Downloaded October 09, 2012 from http://www.aafp.org/online/en/home/media/releases/2012/choosingwisely.html. after menopause, arthritis, bisphosphonates, bone, bone density, bone density chart, bone density scores, bone density test, bone fracture, bone health, bone loss, bone mineral density, broken hip, chest pain, depression, dexa scan, for osteoporosis, health, healthy women, heartburn, hip fracture, joint and muscle pain, muscle, muscle pain, Nursing home, osteopenia, osteoporosis, osteoporosis guidelines, osteoporosis in women, osteoporosis is, osteoporosis risk, osteoporosis risk factors, osteoporosis screening, pain, postmenopausal, postmenopausal women, report, rheumatoid, rheumatoid arthritis, risk for osteoporosis, side effects, smoking, treating osteoporosis, weak bones, x ray absorptiometry. I thought you might be interested in this article on https://universityhealthnews.com: Osteoporosis Guidelines: When Should I Get My First DEXA Scan?